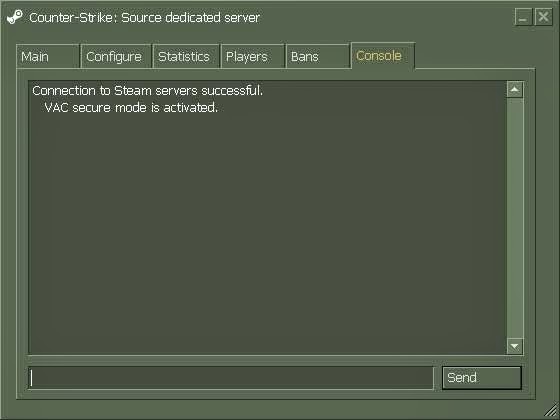 To run the Steam Source Dedicated Server you will first need to install Steam. To install Steam click the link below: A Steam Source Dedicated Server requires Steam. This is the title of your server. By default it is the name of the game you are hosting. This option is grayed out until you start the server. Specify Internet or LAN . Select Internet if you wish for people to be able to join your game from another location. Specifies the maximum number of people that can play on your server. Specifies the port you would like your server to use. Set a password for remote access to the server. After adjusting the server to your liking, press the Start Server button. To edit a value, double-click on its name. Specifies a password players must enter in order to play on your server. This is a good option to implement if you wish to play only with your friends. Specifies the maps you wish to play and the order in which they appear. The maps will cycle according to either your Map time limit or Max win settings available from the Configure tab. From the Configure tab, you may specify how your server runs and implement various server rules. Specifies a time limit on each map. Specifies a limit on wins one team can have before a map change. Specifies a limit for the number of rounds you play on each map. Specifies the amount of time each round lasts. Specifies the amount of time before a round starts. Specifies the amount of time a buy zone is active. Specifies the amount of money each team starts with. Specifies whether players can hear footsteps of other players. Specifies players’ Camera view after dying. A player can watch any other player in the game. A player can watch only his own team players in the game. A player can only move the camera to look in different locations while bound to where the player died. The player cannot follow other players, or move about the map freely. Death cam will fade to black. Players can injure players on their own team. Specifies whether a player who kills a teammate will be killed at spawn time on the next round. Players who have not moved for a set amount of time will be kicked from the server, Players who have killed 3 or more teammates will be kicked from the server. 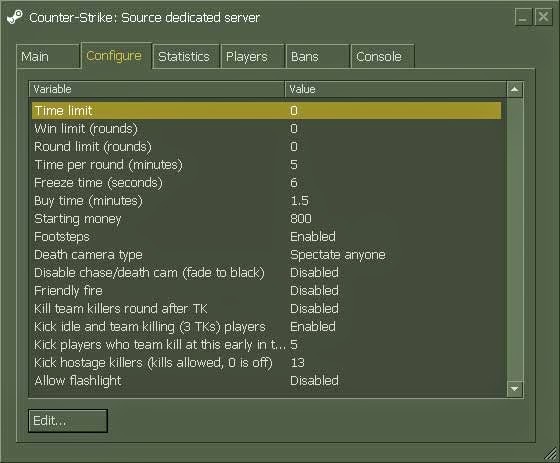 Specifies the amount of time that the server will kick a player for killing a team member at the beginning of a round. Specifies the number of hostages a player can kill before being kicked from the server. Flashlight can be used by players. 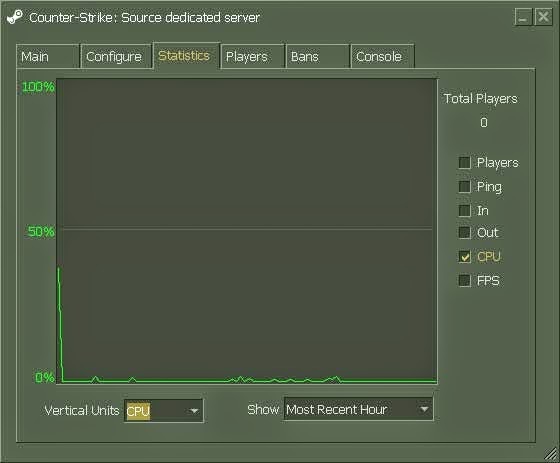 The Steam Dedicated Server offers a variety of viewable statistics. You can view statistics from the most recent minute, hour, or day. To add a stat to the view, check its box on the right-hand side of the dialog box. You can change the Vertical Units to display the range of any one of these stats. The Players tab displays all players currently on your server. In addition to viewing players, you can also kick them from your server or ban them from your server. Kicking a player will drop the player from your server. You have the option to temporarily, or permanently ban players from your server. 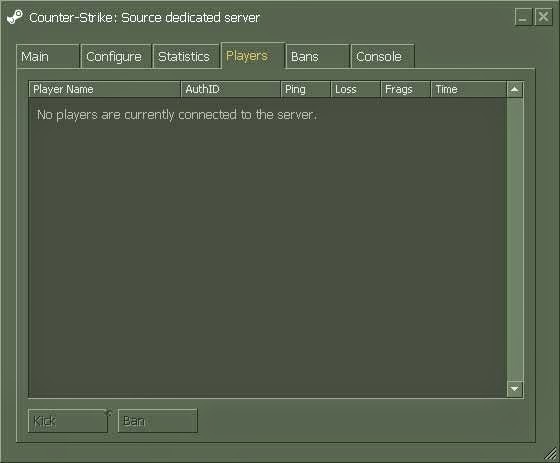 You can manually enter an IP address or use the players’ Steam ID to ban them from your server. 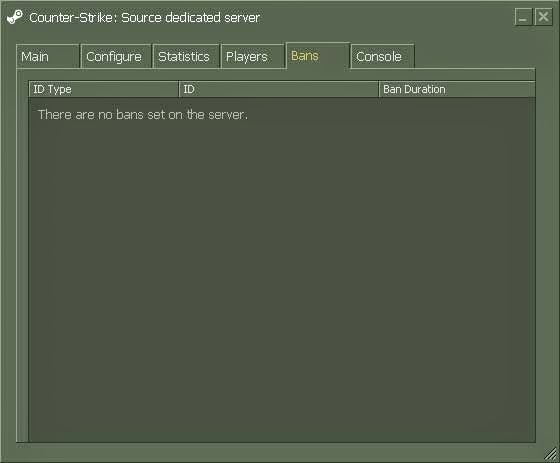 Bans a player by IP address for a specified number of minutes. Entering 0 for minutes is a permanent ban. Bans a player by SteamID for a specified number of minutes. Entering 0 for minutes is a permanent ban. kick Bans a player by SteamID for a specified number of minutes and kicks them from the server. Entering 0 for minutes is a permanent ban. Changes the server to the specified map. For a full list of maps, type: maps * in the console. Kicks a client by their UserID. To find a full list of UserID’s on the server, type: users in the console. Manually sends a heartbeat to the master server. Displays user information about the requested client based on SteamID. Kicks a user by Player name, or UserID. To find a full list of UserID’s on the server, type: users in the console. Lists all SteamIDs in your server ban list. 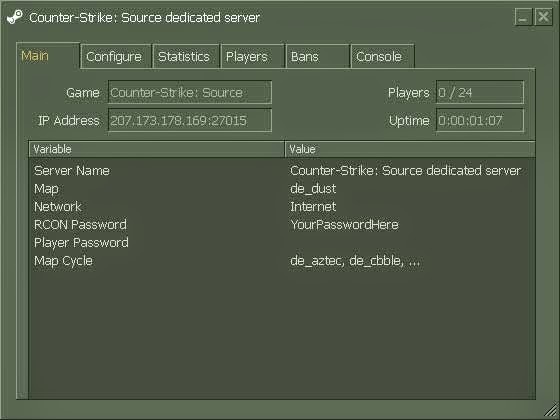 Lists all IP addresses in your server ban list. 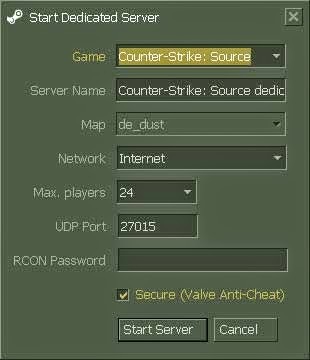 Lists all maps containing a partial name, for example: maps de_ would list all maps with de_ in their name.